All parents schedule their kid’s departure from their home to be around the age of 18 years. I often joke that my twins have an 18-year contract in my house and then they get the boot. So it is hard to put into words how that deadline got moved up by 12 years for my son Prince. 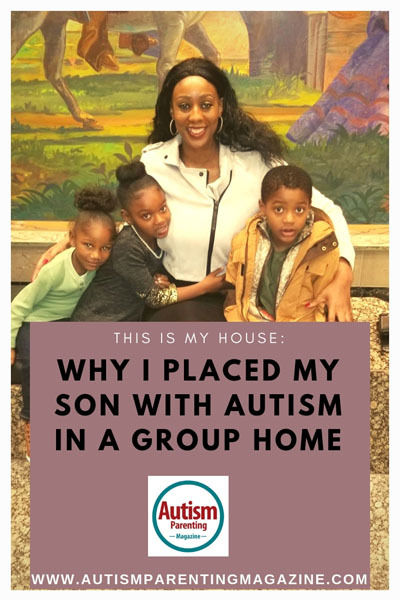 I remember when I began thinking about placing my son into a group home. It was due to probably one of the worse arguments in the history of my family. We were celebrating Thanksgiving at my mother’s house, and Prince was being himself. The self I am used to, but I often forget how overwhelming his behavior is when you don’t spend time with him every day as I do. I was met with dialogue that stemmed from the fact that I, his mother, needed to figure out a way to get this little boy to act normal in the company of others. “Tiara you need to learn how to control him,” or “You need to do your part to control his behavior.” Quite frankly, that day I was tired. I was tired of always chasing him, trying to keep him calm, and holding him down. I was tired, and I never really thought it was a problem letting Prince be Prince when he was in the presence of his family. No one seemed to understand how tired and exhausted I was. I couldn’t understand why was his behavior was ALWAYS blamed on me. Up until that point I had done everything I knew to do for my son. I was taking him to therapy every day in between going to work. I scheduled his doctor appointments, managed all of his medications, and to top it off, I was going back to school. I dealt with the daily meltdowns, the changing diapers for a five-year-old, cleaning up after him, and spending almost every waking hour with my son because no one else could tolerate him. I spent so much time focusing on Prince that I often neglected the needs of his twin sister Tiana. I was tired, alone, frustrated and defeated. I was really tired of catching the blame for all of it. I was tired of hearing back from other people, about the mean things that were said about me and my son spewed from the mouths of people that claim to love us. For months I forced smiles and hugs to try and keep the peace. My initial motive to move him into a group home was selfish; I will admit that. My anger and frustration are what led me to start making calls. Silently, I began placing his name on waiting lists for group homes in the area and state. However, when I started actually getting calls back, I soon realized that this is not a choice I could make in my current state of mind. I love my child with all of my heart, and I had to make sure if I ever made the choice to send him to a group home it would be because that was the best decision for him and my family. The twins are my entire world. I have no husband or no boyfriend. They are literally all I have. I fight daily to be their voice and protection. From the moment I realized that my son might have challenges, I have advocated for him. I could not let my baby go into placement until I was sure I had given this everything that I got and I still had a little bit more to give. For several months, I let the thought of placement escape my mind for a bit. I was still talking to homes and being proactive, but I was not ready to take that leap yet if the opportunity arose. Prince started a new medication, and it seemed to be working for the most part. But two events, in particular, let the thoughts creep back into my mind again. The first event was our trip to Costco with my mom. I had carefully assessed his mood before taking on this adventure, and I believed we would be okay. I was wrong. Prince had a full blown meltdown! He began walking up to strangers hitting them. He was screaming at the top of his lungs. It took about 30 minutes to fully get him out of the store and to the car. While I was a bit overwhelmed…I was used to this. My mother, however, was not. I viewed it as a blessing in disguise because I really needed her to see this for herself. I really needed her to understand why I cringed at the thought of taking my son to the grocery store with me. I needed her to understand how easy it is for me to lose sight of Prince when we were out in public. I needed for my mother to understand the prison me and Tiana were held captive to every single day. And this is the day I believe she finally understood what my cries were all about. She finally got it. For some reason, this simple request plagued me for days…because it was such a simple task. And I could not fulfill it for her. She often asked me such simple requests that are normal for a six-year-old child, but I couldn’t accommodate her. Tiana is a big dreamer! She wants our first real vacation to be in Paris. When we go downtown in Des Moines, she always calls it New York City, and I don’t have it in me to break her heart, not one more time. So I don’t. Instead, we look at the Empire State Building and pass by Broadway. I began to think about the next 12 years of our lives, and how they may play out if the circumstances remained exactly like they are today. I had to have an open and honest dialogue with not only myself but with my family. Would we ever be able to go to Disney Land, birthday parties, basketball games, or really anything outside the four walls of my home? Would I ever be able to get a full night’s sleep without my son waking up at 3 a.m., unable to fall back asleep? Were the rest of my days destined for medication management and changing diapers for the son that I loved so dearly? Would I ever be able to progress in my career and create generational wealth for my family? Would my daughter ever get a fair shake at a normal life if ALL my time and efforts were focused on solely my son? For my sanity, I had already taken Prince out of three very much needed therapy programs in order to go to work more. Prince needed more attention and care than I could provide alone, and as it stood, Prince got 90% of me and Tiana got the remaining 10%. The older Prince got, the more evident his needs became. He would always need assistance well past the age of 18. And I could no longer neglect one child to care for the other. They both deserved better, and I was determined to make sure they would get it. Imagine two of your kids are in extreme danger…they are hanging from the edge of a cliff and the only thing keeping them alive is your firm grasp of each of them. You are doing your absolute best to hold on to both of them, but after some time you realize in order to save one…you have to let go of the other. How does any parent decide which child to save…and which one to let go. As a caregiver, these questions at first sound so selfish to ask, and guilt fills your entire body. I spent ALL of my time making sure that I was doing what was best for Prince. I forgot to make provisions for myself and Tiana. I had to face the fact that in some aspect I had let Tiana fall off the cliff in order to save Prince. This was the wrong approach. My thinking needed to shift…I needed to create a plan that was best for ALL OF US. Thus I began the search for a long-term group home for Prince. Every family dynamic is different, but no parent should ever have to make the choice of figuring out which child to save. Making the decision to move Prince into a group home was the hardest choice I have ever made in my life. I still struggle at night knowing that he is not at home, and can’t come to my room and find his momma. But I rest easy knowing that he is with staff that is trained to handle his behavior and make sure that he gets everything he needs. Not to mention he loves living in a house where he can be himself unapologetically. Prince is doing great in his new home. And every day I learn to cope with our new situation a little better. I look forward to being “Mom” to my kids again, and not that crazy lady they used to live with. I didn’t have to let him. Instead, I found help so that I could save them both! Tiara Mays is the creator of the popular #TwinChronicals™ Facebook blog series. A hashtag that simply began to provide her grandmother updates about her great-grandchildren, over time became a popular pastime for many parents in the Des Moines, Iowa area. Parents across the country resonate with Tiara’s many interactions with her twins Prince and Tiana as she shares her life being a single mother raising twins. Tiara currently lives in Des Moines, Iowa where she raises her two children, Prince and Tiana. She attended Iowa State University where she earned a degree in psychology with a minor in sociology. She recently graduated with an MBA degree from Purdue University Global. In her free time, Tiara enjoys writing and reading. In 2015 her son Prince was diagnosed with autism, and she has spent the past three years advocating for services to be developed for children with autism in the state of Iowa. It is such a difficult decision to make. I have 2 autistic boys and very little support except my spouse and daughter. I feel your pain and thank you for your honesty and continued battle for help for these very special and unique children who deserve the best! Hi Shelly! Thank you for your comment. We appreciate it. Why are you posting articles that make it okay to send your kid to a home???? There are therapies to make sure a parent does not have to do that. Thank you for reading the article. It is absolutely ok to send your child to a home to get better care if that is what is in the best interest of that child and your family. Every family dynamic is different and this option may not be the best for them. In my particular situation, I worked basically part time to accommodate my sons needs, until it we nearly lost everything including our home. This article is meant to support those family’s who may not fully see other options as a possibility. This choice was made with careful planning and futuristic goals in mind. My son is thriving, and that is all I want as a parent. For him to have full access to services at his beck and call without the restraints of his single working mom’s schedule. Hope this helps!